Sunscreen may be great at protecting you from sunburn, but the greasy substance is not great for any surface besides skin. Removing the sunscreen gunk from surfaces, especially leather, can be tricky. Luckily, though, there are some tried and true methods for avoiding lasting sunscreen stains. Whether it's sunscreen on leather car seats or a bottle that's exploded all over your leather traveling bag, the most important thing to do with spilled sunscreen is to clean it up immediately. As soon as you eye a spill, start to blot at it with a soft, dry cloth. Be careful not to wipe as that will only allow the sunscreen to ooze deeper into the fabric, ultimately making it more difficult to remove. Blot away as much of the excess sunscreen that you can with the cloth. Then, sprinkle a solid layer of cornstarch or baking soda onto the remaining sticky spot and let it sit for at least 12 hours. Both products have great absorbing powers, and may be able to pull the sunscreen away from the leather before it has a chance to turn into a stain. Hopefully, after about 12 hours, you should notice that the white powder has turned yellow. That means that it's soaking up the sunscreen, and you can begin to gently blot away the yellow cornstarch or baking soda with a slightly damp, warm cloth. Unfortunately, sometimes you don't always spot the sun cream on the leather sofa right after it spills. The sunscreen may have had time to sink into the couch's fabric and leave behind a stain, often a yellow one. In that case, it's time to treat the stain with a leather cleaner. Many people know that Goo Gone on leather seats works as a great remover, and other brands of interior leather cleaner also work well. Be sure to pick one that is safe for your particular leather as some are better suited to dyed leather furniture as opposed to a tanned leather jacket, for instance. A little bit goes a long way with these cleaners. Splash a few drops of a leather cleaner onto the spot. Then, using a clean microfiber towel or a soft-bristled brush, gently dab and brush away at the stain until the cleaner helps to remove it. For stubborn stains, you may have to repeat this process a few times. Eventually, you should see that the leather sofa lotion stain disappears. The method is the same whether you're removing zinc sunscreen or chemical sunscreen. 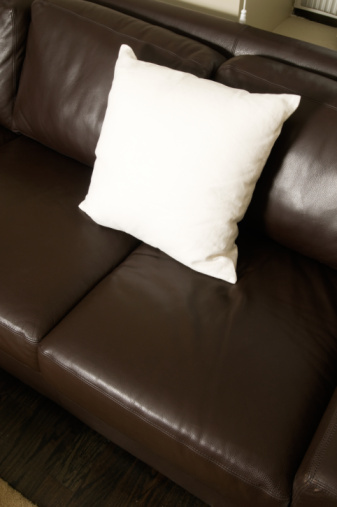 When you're done, it's smart to follow up any leather cleaning with a leather conditioner product. A few drops of a conditioning product will restore some of the essential oils that a cleaner may have stripped from your leather, even its tone and help keep it protected against further spills. Finally, take precautions like keeping your sunscreen in tightly sealed plastic bags and only applying when far away from any leather to avoid future mishaps.